My plan tonight was to write about art as truth-telling, and hope you wouldn't flog me for quoting yet again from Robert Olen Butler's "From Where You Dream." I think writers can fairly be described as morose. We spend great chunks of our lives thinking of ways to make our characters miserable, and still more time getting into, really into what miserable feels like so we can describe it to our readers. Healthy minds don't do this. Just this afternoon, an upbeat conversation with my husband ducked into a dark alley and transmogrified into a discussion of one of the saddest episodes of my life. Then, just as I began to explore and map out the source of my tears - to a writer, everything is material - my husband wisely suggested a drive in the Miata. 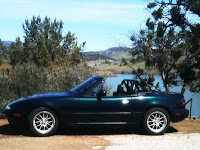 The Miata is a joy machine: wind and sunlight and wide open skies. Within moments, we pulled from our driveway and wound through the the neighborhood, waving at the lady in the BMW Z3 convertible who obviously had the same idea. We stopped at the MacDonald's drive-through to get our soft-serve ice cream cones, and then soared off down country roads, with James Taylor singing from the speakers behind our ears: "Hard Times Come Again No More." While we all sup sorrow with the poor;"
But James Baby sang them so sweetly, and for just that moment, we didn't pause in life's pleasures. We accelerated. "What I want to nurture in you is the impulse: 'I'm ravished by sensual experience. I yearn to take life in. My God! I've got this sense that the world has meaning. Things roil around in my dream space, and I've got to figure out how to make art objects of them.'" Think about it: Isn't it joy, even if you're describing misery? Doesn't it ultimately source itself from the very Christian assurance that the essence of the universe is a loving, dancing triune God who works all things together for good? But what if that inner joy, that thing that makes you an artist, is describing wind and sunlight and wide open skies? Can you get into, really into that as well? Writers, tell the truth. The whole truth, with all your heart and soul and mind. Make your darkness dark, but make your brightness bright as well. the time of singing has come...'"
Now you give me some of your favorite joy passages. Or better yet, write one. "Come, derry-dol, merry-dol, my darling!" *Dana Gioia put it this way in a recent, wonderful Kindlings Muse podcast: "I try to write so truthfully, that someone who knew everything about me would not find any cheating, any prevarication, any sloppiness in it." Leaves quiver at the touch of drops. The air, now washed of dust and spring-time burns, is tinny and hopeful. The softened earth will surrender weeds when skies are mostly sunny. "Things roil around in my dream space, and I've got to figure out how to make art objects of them." So many reasons why I love coming here. Patti, did you write that? It's wonderful. "The air... is tinny and hopeful." Love that. Wendy, we love having you here. Thank you! "But what if that inner joy... is describing wind and sunlight and wide open skies?" I so needed this encouragement today. My joy level was zilch and I'd been stalling about going to the lake just to perch on a dune and stare. But now my mind's made up. After I drink in enough of those desert blue skies, deep azul waters and rugged but barren spaces, I'll be renewed and refreshed. Joyful. Then I can face the nightmare that drained me of joy. Ellen, I'm so glad you're going to the lake, and rejoicing that my post helped you decide. Please give us a full report upon your return. I'm praying about that nightmare of yours, but meantime, you're wise to soak in some blue skies. Thank you for your encouragement, Kathleen. I arrived back scorched but refreshed. Problem is, it's been so long since I've soaked up the view and desert colors, that I'd better plan on going again later this week. My writing nightmare is more I've been off that task for so long, I'm having a hard time getting focused again. Easier to yield to life, and granddaughter sitting! But I will overcome, with my Savior's help, and finish pouring this story out. Now if I can just remember: time in the chair, internet off. A favorite place of mine to refresh myself in simple joy is GOOD POEMS FOR HARD TIMES selected and introduced by Garrison Keillor. Ode to American English by Barbara Hamby is especially a favorite. Yesterday I made it to the lake and back. Felt scorched. No wind at all. But the wide expanses and blues of lake and sky refreshed me. Must need to go again, 'cause I'm still not ready to write. Thought I posted this yesterday. Mmm, the mind goes first, they say.